Golden State Warriors Suffered their First Lost of the Season against the DenVer Nuggets! 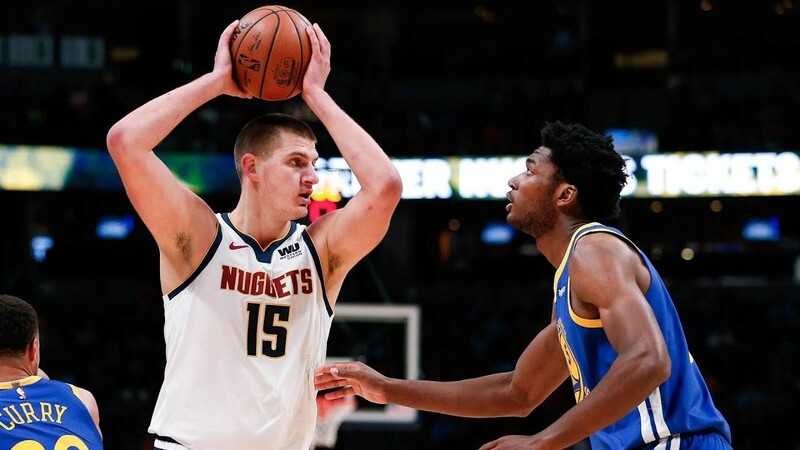 Juancho Hernangomez saves the day for the Denver Nuggets with his game saving Block against Damian Jones and the Nuggets defeated the Golden State Warriors, 100-98 on Sunday night. The Nuggets did a great job defensively as they keep the lead in their hands in the second half. Their defensive intensity was superb and all the guys on the floor gave their best effort against the best team in the NBA today. Denver forces the Warriors to have 18 turnovers which is the key to their win. Nuggets now is 3-0 and that was the best start since the 2009-2010 season where Carmelo Anthony led the Nuggets to a 5-0 start back then. The Warriors are trailing by 13 points in the fourth quarter but they made their run and keep the game close. In the 1:29 marker, Andrei Iguodala ties the game with his dunk in transition. With 11 seconds left in the game, Millsap puts the Nuggets up by 2 points with his pair of free throws. And then with 9 seconds left, Green was fouled then shoot free throws but he just get 1 in and the Nuggets gets possession. The dubs immediately fouled Murray and Murray drains 1 free throw to put the Nuggets up by 2 points again. The Warriors had a chance to tie the game as Curry drove to the basket and drops a pass to Jones but Juan Hernangomez blocks Jones to seal the win. In my opinion, the Warriors are over reacting to non-call fouls. They are continuously arguing and complaining to the referee. But there are really no fouls in their complains. The refs just did the right thing not calling for a soft contact. They are just too soft if they think that there's a foul on those situations. Durant even called for a technical. If you watch the NBA in Birds era, fouls there are too hard. Man, I think the Warriors should just play well. They are already great and I don't think they needed to complain every time. Gary Harris was excellent for the night on both ends of the floor. He recorded 28 points, 3 rebounds, 1 assists, 2 steals and 1 block shooting 55 percent from the field despite missing 7 of his 9 attempts from beyond the arc. Nikola Jokic still punished the opponent with his 23 points, 11 rebounds and 6 assists. Jokic was 50 percent from the field after going for 100 percent on 11 for 11 shooting last night. Mason Plumlee also played well off the bench as he scored 11 points with 2 rebounds, 2 assists and 1 steal while Juan Hernangomez had 8 points, 2 rebounds and 1 block (the game winning block). For the Warriors, Durant finished with 20 points, 11 rebounds, 7 assists, 1 steal and 1 block. He shot 36.8 percent from the field only. Klay Thompson added 15 points, 7 rebounds and 1 block shooting 43.8 percent from the field and only making 1 out of his 6 three-point tries. Stephen Curry led the dubs in scoring with his 30 points, 4 rebounds and 6 assists. Curry shot 6 for 16 from beyond the arc and 10 for 23 from the field. And lastly, Draymond Green only had 4 points, 5 rebounds, 4 assists and 1 steal. Warriors will host Phoenix next on Monday night while the Nuggets will host the Sacramento Kings on Tuesday night.